Alisson marked his Liverpool debut with a clean sheet as the Reds thrashed Napoli 5-0 in a friendly in Dublin. Liverpool made the Brazil number one the world's most expensive goalkeeper when they agreed a deal with Roma last month worth up to £66.8m (72.5m euros). Alisson only had one serious save to make when he turned away Lorenzo Insigne's first-half attempt. Liverpool scored through James Milner, Georginio Wijnaldum, Mohamed Salah, Daniel Sturridge and Alberto Moreno. Midfielder Milner went off in the second half after an accidental clash of heads with Mario Rui. He needed 15 stitches in what manager Jurgen Klopp described as a "crazy cut". Pre-season friendlies - how has each Premier League team been getting on? Trent Alexander-Arnold and Roberto Firmino made their first appearances in a Liverpool shirt since playing at the World Cup in Russia. However, it was his Firmino's international team-mate who fans at the Aviva Stadium were really keen to see in action after his high-profile arrival. In truth, Alisson had little to do - but he was solid when he was called into action. The 25-year-old's distribution was impressive, along with his commanding presence and ability to deal with Napoli's corners. Alisson's most serious test came in the 26th minute when, with Liverpool already 2-0 ahead, he did enough to keep out Insigne's low effort. The Reds took the lead through Milner's fourth-minute rasping shot and Wijnaldum's header made it 2-0 inside 10 minutes. 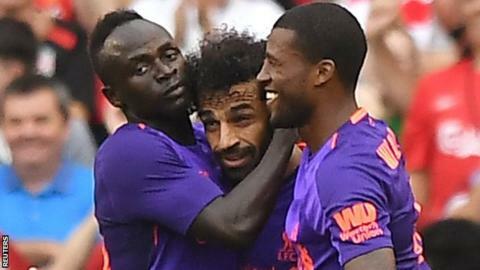 Salah curled a third into the top corner, before substitute Sturridge made it 4-0. England forward Sturridge then played a glorious cross-field pass to set up Moreno, who hammered home a spectacular fifth. Liverpool entertain Italian side Torino at Anfield on Tuesday before they open their Premier League campaign at home to West Ham on 12 August.